how about just checking out the ETK? It's all in there. Wolf, the ETK doesn't apply here. On cars that came with the X-brace, there were threaded holes from the factory out by the pinch welds, to bolt the ends of the bars to ; they don't exist on early cars. The best way I know to add the X-brace is to weld a small chunk of angle iron to the bottom of the car and then run a nut and bolt thru it and the bar. Much better and stronger than trying to install a nut-sert fastener. How come the middle half of any project always takes the most time? Yes been there done that. The difference is there 92+ cars have different torque boxes with the stamping and welded nuts required to install the brace fully. I have had a long think over it and at the end a threaded insert isn't going to do much as the torque boxes are spot welded to not only the floor, they are welded to the engine perch rails and the rockers, both are main structural pieces. As the torque boxes are fairly thin, it is their stamped shape that enables them to transmit forces to the frame bits described earlier. With that understanding, the only options are either welding brackets or square tubes to the torque boxes as spacers but ensure they are taken all the way to the frame rails and rockers. Other option is to buy the sheet metal from bmw, replace the torque boxes with the later ones and effectively updating your car to 92+ spec, which I've done. Now after all that, many members here have just simply sawn off the brace extensions and forget about the torque box fasteners. And to be honest, unless you autocross your car or have OCD like me you're probably not going to gain much extra. IMO it does apply because it shows the adapters incl. bolts (#3 and #4) needed to mount the X-brace to the subframe. And regarding the extension I have to correct you. Some pre '92 cars (may be only ECE spec?) do have the frame extensions but a non matching threaded hole. My yellow 850 (03/1990) is one of them while my black one (03/1991) doesn't. Pretty strange indeed and I can't detect any logic in there. Since any welding and/or drilling is a potenrtial new spot for corrosion i decided on both cars to just ignore the X-brace extensions and left them unfastened. I didn't even cut them but have them "hang loose". Still a massive improvement. Yup, there are definitely brackets and such that one will need from the ETK. I can confirm that. Mine 11/91 had wrong holes and no welded nuts inside. Yup, no logic there. The height of the stamping is also wrong. Too much schnapps on that shift at dingolfing I think.... You sent me pics from your yellow car when I was researching and I got even more confused haha. If my torque box stampings were at least at the correct height I would have just drilled new holes and use hi torque threaded inserts. The x-brace and upgraded sway bars are parts of my suspension upgrade. I will eventually figure out the installation, but you pros have 'been there done that'. I will usually ask first unless it seems obvious. And even then...the easiest ones sometimes get you. Bit OT, is the front subframe of the e31 similar, or almost identical to that of an e32? Meaning would this cross brace bolt into an e32? Yep. You can use it on the E32 as well as on the E34. I've mounted it on both already. Straight forward bolt on job as on the E31. In these cases I only did cut the extensions of the X-brace. One customer of mine has an E34 track car and upgraded it with the X-brace. Best upgrade ever to the suspension he says. Last edited by wokke; 09-18-2014 at 02:30 AM. I was only talking about attaching the outboard ends re: the welded angle iron bracket. For you guys that have added the X-brace, did you also get the new heat shields as well? No heat shields renewed on my cars. I actually removed them because they were broke and sometimes rattled which drove me nuts. Just the man I was hoping would respond - cheers! Has anyone fabricated an aftermarket X-brace for these cars? Why would you want that? What are you hoping to gain over the factory x-brace? If the thinking is that a custom piece will make the rear extensions fit on a pre 92 then it's really a fool's errant IMO. This is because the post 92 torque boxes (i.e. 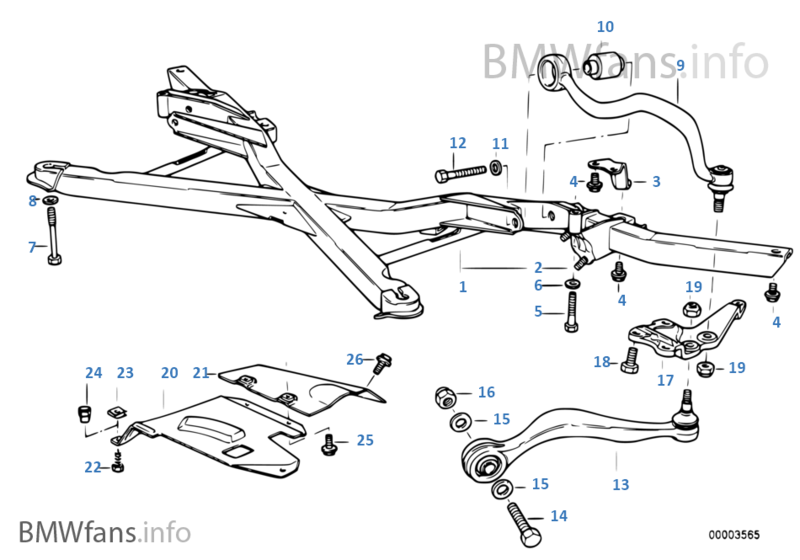 the pieces of stamped metal that goes from the rear of the wheelwell to under the footwell, its used to spread engine torque and chassis loads to the rest of the chassis rather than just the engine cradle and firewall interface) are stamped differently to take advantage of the x-brace to transmit forces to the structurally stronger parts of the chassis rearward past the firewall. If this wasn't necessary then bmw could have easily made the x-brace's extensions so that it sits perfectly on the pre 92 torque boxes, all they needed to do then was to put a couple of weld nuts on it. But they didn't, it was a new stamping. I'm of the opinion that beancounters never approve new parts revisions unless it's necessary. My speculation is this - after the initial release of the car it was found out the front box is a bit weak (if you imagine the car as 3 boxes, engine, passenger and trunk), so they need a brace too keep the lower suspension points in their relative positions. Then they also found out the chassis is also a bit weak under torsional load between the front and middle box (picture a drag car lifting one front wheel on take off, though from suspension loads rather HP lol). So they extended the brace's design PAST the front box into the passenger box, effectively increasing the torsional rigidity between the front and rear suspension points. Voila, you have the shape of the x-brace we have today. So, again it's just my opinion - either cut off the extensions and be happy that you fixed problem 1 or go the whole hog and fix both issues. Last edited by affa; 03-19-2018 at 05:34 AM. Thanks for the info and explanation! The only reason I asked about an aftermarket brace is because I cannot find a brace stateside. I bought mine direct from bmw a few years ago. May be it's nla now but it was only 130 or something like that... the new torque box panels are about 30 bucks a side. Good luck! I lucked out and found an X-Brace on Ebay earlier this week. It arrived today and its in great shape. Waiting on a few pieces of hardware so I can install it soon. The seller put another one on Ebay a day or two ago, but it has already sold. I have not found time to climb under my car to mount the X-brace I bought recently. Here are a couple of links to other threads on the brace. There is an adapter, part #3, and I bought a couple of them recently. I have also seen where someone took what looks like a piece of square tubing, cut the top side off, welded a nut on the inside, and then fitted and welded this mount onto chassis so that the long rear leg of brace could be bolted on. I have not confirmed it yet, but there may be a gap of an inch of so between the long rear legs of brace and where it meets the chassis which is why the square tubing bracket was made to fit leg to chassis. i just cannot find that thread. I finally mounted the X-brace on my car today at a new DIY shop where a lift is available. I did not realize that I needed shorter anti-sway bar links so I will have to go back tomorrow with some adjustable links. I also spent some time making up cardboard templates so I can fab some brackets out of 1.5" square tubing like Bryson made for his car so rear arms can be bolted down at the ends.